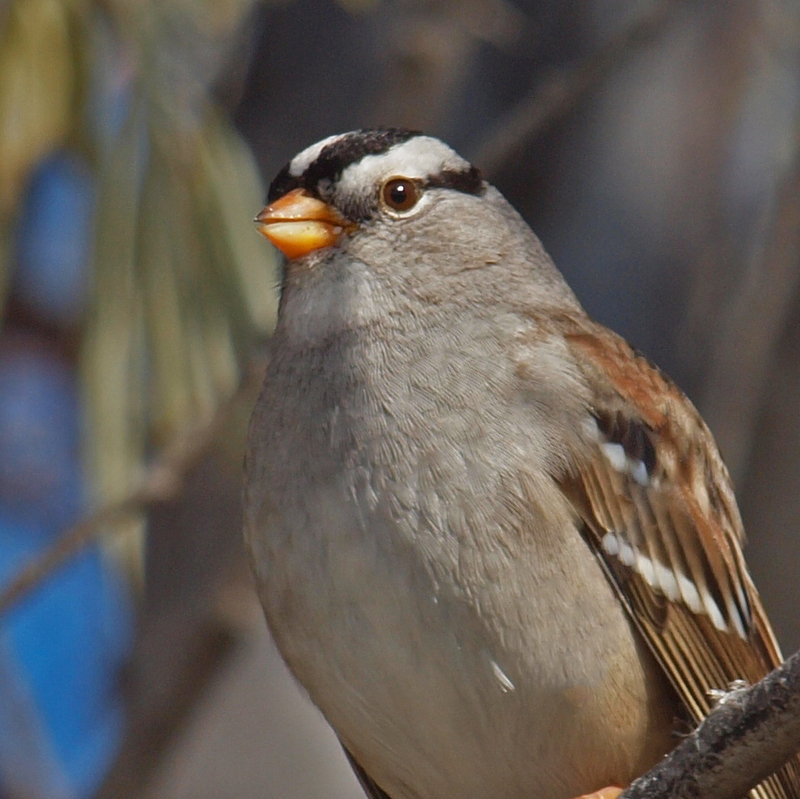 White-crowned Sparrows are one of my favorite winter birds. I love their striking appearance and their winter song. I obtained the photo above by sitting on the cold sidewalk for a half hour at my new lunch-hour birding patch where a flock of White-crowns were foraging in the Russian Olives. This handsome adult posed nicely for me just feet away. Bonus points if you can name the subspecies in the comments. * I really enjoyed Laurence Butler's post and photos of birds he found at the Desert Botanical Garden in Phoenix, AZ; especially because that was my lunch-hour birding patch for about a year. * All of Scott Simmons posts this week had wonderful bird and nature photography. Don't miss any of them! * Kathie Brown got to hang-out with Julie Zickefoose at the Mass Audubon Visual Arts Center. Cool! * Lillian Stokes offers up some fun facts about some of your winter feeder birds. * Kelly Riccetti shares some close-up photos of an Anhinga on a nest. * Greg Gillson photographed a Golden Grebe in Beaverton, Oregon...not some new species, but rather a Pied-billed Grebe in a golden setting. Nice! * In addition to Jeremy Medina's Sparrow Anticipation post here at BiF! that got some ABA Blog love, he also posted on his own site a nice little Belted Kingfisher profile, his 200th bird species in Pima County. * Speaking of blog love, A DC Birding Blog mentioned Steve Creek's Bird Hygiene here on BiF! Steve's Birdtog has a nice assortment of bird photography posted this week too that you need to check out. * Dan Huber recently had a fowl day, so give why don't you stop by his blog and give him some love too. * Mia McPherson always comes through with amazing bird photography. You've got to see her Great Horned Owl, Rough-legged Hawk, and Prairie Falcon images. Very nice! * A trip to Florida gave Rob Ripma the chance to enjoy and photograph some awesome birds. 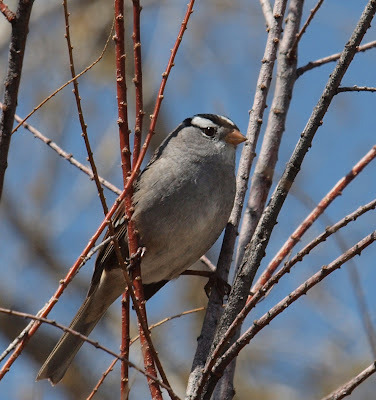 * Pat Bumstead has a share-worthy guest post from Janet Plante sharing photos of finches in the boreal forests of Canada. * The ABA Blog also shared Rob Fergus' adventuring taking his kids to see the Snowy Owl in New Jersey. * Eagle Optics and the ABA partner up - buy certain binoculars from Eagle Optics and you can get a discount on ABA membership or gift the discount to someone else that is not yet a member. Cool idea! * Brownstone Birding Blog's Keys to Proper Misidentification of Birds was a fantastic and fun read! * Bill Schmoker's post on the ABA Blog Playing with Food was a really good one. I'm such a sucker for photos of birds eating stuff. * I'm really enjoying following John Vanderpoel's Big Year. He's at 734 right now and most certainly chasing this week's North American rarities. * Alex Vargas never ceases to impress with his awesome bird photography from all over the globe being shared at BirdingBlogs.com. * Linda Rockwell's bird photos from the Rio Grande Valley Birding Festival make me anxious to go there in the future. Great work Robert, thanks for bringing it together. Is that a Gambel's subspecies? These weekly birding blog summaries are something to which I really look forward. You often find quite the gems! I noticed right off the clean, bright, White-crowned Sparrow with white lores--Gambel's it is!